After analysing more than 2000 hours of coastal shark sightings, researchers from The University of Western Australia and other collaborators have warned that habitats important for juvenile shark survival are not adequately protected. The researchers used footage from cameras mounted on baited remote underwater video systems (BRUVs) to predict the distribution of 21 shark species in the tropics and have developed the first large-scale predictions of juvenile shark occurrence in northwest Australia, an area covering some 490,000 square kilometres. Despite the importance of juvenile survival for the effective management of sharks, the scientists were surprised to discover that the most suitable habitats for juvenile sharks did not overlap well with no-take marine protected areas (MPAs). MPAs are areas of the ocean where no extractive activities are allowed. PhD researcher and lead author, Beverly Oh from the UWA Oceans Institute, said that it was important to know the most suitable habitats for juvenile sharks because it provided priority areas for management. "Large MPAs are an increasingly popular strategy for protecting the world's oceans, however the large-scale information needed to assess their effectiveness is lacking for many species," Ms Oh said. "Predicting species distribution patterns provides a solution to the issue of incomplete information for conservation planning at large scales." When overlapping the distribution maps with existing and proposed marine reserves in the region, it became clear that no-take MPAs in northwest Australia included less than 0.6 per cent of the most suitable habitats for juvenile sharks. "Such findings are concerning because existing and proposed no-take MPAs currently cover 2 per cent of the region and suitable habitats for juvenile sharks are significantly under-represented," Ms Oh said. 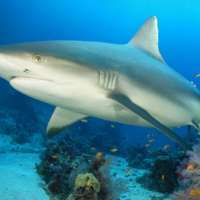 "While marine reserves in the region were not specifically designed to protect sharks, previous research has shown that protecting sharks is important for maintaining healthy reefs." Study co-author Professor Jessica Meeuwig of UWA's Centre for Marine Futures, said that the findings were particularly important for the eastern Indian Ocean, an area that is relatively poorly studied. "Our maps of predicted occurrence can help guide the design of more targeted sampling programs, and the identification of priority areas for shark conservation in the context of further development of MPAs," Professor Meeuwig said. Study co-author, Dr Ana Sequeira of UWA's Ocean Institute, said the approach used represents a simple framework for assisting with understanding the effectiveness of MPAs from mapped distributions. "Such approaches are particularly important in remote locations where knowledge needs are high and research funds are scarce," Dr Sequeira said. Ms Oh said identifying key habitats could ultimately help rebuild shark populations. "At a time when shark populations are declining throughout the world's oceans due to overfishing, this approach is an essential tool for conservation and management," Ms Oh said.